No, not getting jumped like that! A quick how-to guide on jumping your car’s battery. 1. Identify the positive terminal on your car’s battery. 2. Connect one of the red positive (+) jumper cable clamps to the dead battery’s red positive (+) post. 3. Connect the other red positive (+) jumper cable clamp to the good battery’s red positive (+) post. 4. Take the negative black (-) clamp that is on that same end of the jumper cables and connect it to the black negative (-) post on the good battery. 5. 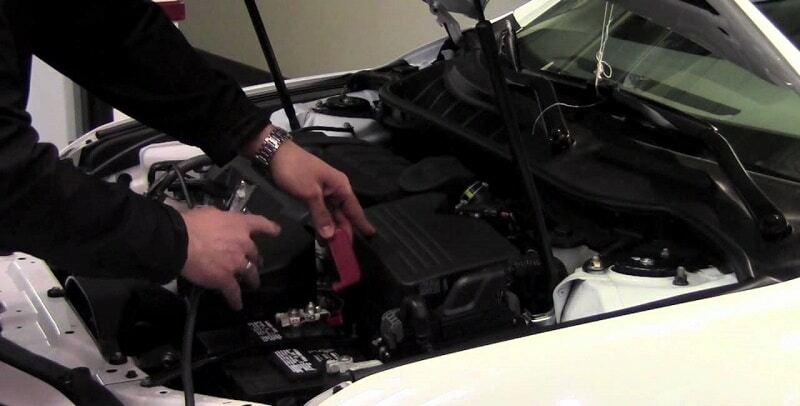 Find an unpainted metal surface under the hood of the vehicle with the dead battery. 6. If connected to another vehicle, then turn on the working vehicle. If connected to a portable jump starter, then flip it on. 7. Disconnect the jumper cables. Red is positive, black is negative. Red is positive, black is… an unpainted metal surface? You’re in the car in your driveway waiting to take your daughter to soccer practice. A reedy, endless chugging sound fills the car as you try to start the engine, with dismal results. Your battery is dead. Luckily your neighbor loves jumping cars and he sees this whole thing going down from his perch on his lawnmower. Over he comes with his car and his cables, ready to restore your battery. First, he shuts his car off (your car isn’t starting, but make sure the ignition is off and the vehicle is in park anyway). He throws on his parking brake for good measure. Next, he starts connecting the cables. On his battery, he puts the red clip on the positive terminal (if it’s not labeled with a “pos” or a “+” you can safely assume it’s the larger of the two terminals) and the black clip on the negative terminal. After he connects the cables to his living battery, he goes to work on yours. He connects the red clip, again, to the positive terminal on your dead battery. Then he clamps the other black clip onto an unpainted metal portion of your car. “On the car with the dead battery” your neighbor says “red clip goes on positive, black clip goes on unpainted metal.” You nod at the reiteration, it’s all making sense to you now. Now that you’re hooked up, your neighbor instructs you to go start your vehicle. “Good to know” you say, getting in your car. Now that’s a happy hypothetical ending. We want to make sure that you’re prepared when this situation happens to you. So, below you’ll find our step-by-step guide on how to jump your car. If you discover that your vehicle’s battery is dead, then there is no need to panic. As long as you have a few key items in your trunk, you’ll be back to driving down the road in no time. It should have the + sign and it will definitely be marked with the color red. If you’ll be using jumper cables to get a boost from another driver’s vehicle, then you’ll also want to find the positive terminal on that vehicle’s battery. Make sure the vehicles are off! 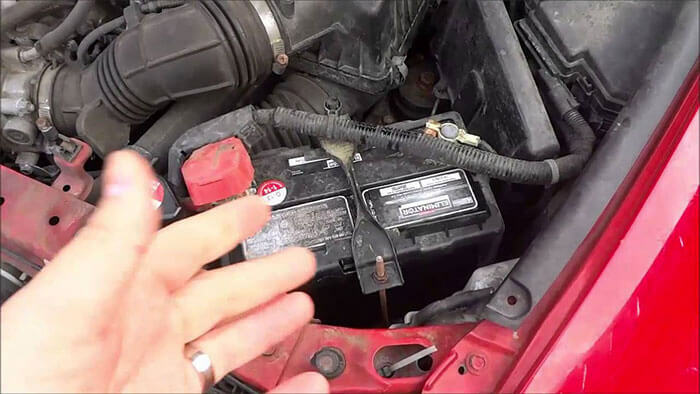 If you’re using a portable jump starter, then you will use its red clamp to connect to your vehicle’s dead battery positive terminal. If you’re using a portable jump starter with the clamps already attached, then you can skip this step. Be very careful so that you do not let the positive and negative clamps touch each other because it will create sparks. And, it can short a portable jump starter. This is as simple as it sounds. And yes, the vehicles (and/or the jump starter) should still be off. This is where you will connect the other negative (-) black clamp. Do NOT connect it to the other car battery or it might explode! Once you finish this step, everything should be connected and ready for trying to jump start the car. You should let the working vehicle run for around five minutes to give it time to give the non-working battery a boost. Then, try to start the car with the dead battery. If you can’t get it to turn over, then turn off the working vehicle and reposition the black clamp that you have on the metal surface. It might not be getting a good connection and you just need to retry it once you move it to a different part of the metal surface. If that still doesn’t work, try revving the engine of the working vehicle to see if it will deliver enough amperage to the alternator to get the engine to turn over for you. You should remove the clamps in the reverse order of when you placed them. So, start with the most recently placed and work backwards. Remember to drive the vehicle around a bit before you cut the engine again so that it will start back up for you. Having the engine running charges the battery, so drive for at least 10-15 minutes before turning the engine off. This will ensure the battery has a chance to charge back up before you need it to start your car again. If your car doesn’t start again the next time you’re looking to head out, it may be time to have that battery looked at and replaced. If you’ve never jumped your car before, make sure to give the owner’s manual a once-over. Any extra steps or important information on the jumping of your vehicle should be in that manual. Make sure the jumping cable clips never touch each other, especially while one end is connected to a battery. If you want to be extra prepared, you can pick up a pair of emergency jumper cables for twenty dollars (or less).